CHARLESTON HARBOR: Upon completion of deepening, inner harbor will have 52 feet and entrance channel will have 54 feet of depth. Charleston harbor to be deepened to 52 feet. Charleston harbor awarded $49 million in US Army Corps of Engineers work plan. USACE work plan allocates $956 million of Congressional funding for coastal and inland navigation projects. The US Army Corps of Engineers (USACE) announced $49 million for the Charleston Harbor Deepening Project in the Fiscal Year 18 Work Plan, critical funds that will be coupled with financial support from the State of South Carolina to further the progress of deepening the Charleston Harbor to 52 feet. The USACE Work Plan funding, in combination with a $50 million loan from the state, will enable the Charleston harbor to be deepened to the Wando Welch Terminal by early 2021 in a record construction period of only 40 months. 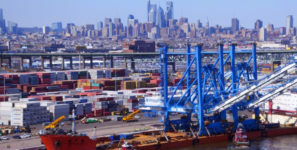 The completion of harbor deepening projects is essential, with multiple 14,000 twenty-foot equivalent container unit (TEU) ship slings calling US East Coast ports today and the strong likelihood that an 18,000 TEU ship service will be deployed by 2019. The ability to fill these large container vessels with heavy export cargo in the Southeast is critical and requires harbors of 50 feet or more in draft to remove significant navigation restrictions. Upon completion of Charleston’s deepening, the inner harbor will offer 52 feet of depth with a 54-feet deep entrance channel. The USACE work plan allocates $956 million of additional Congressional funding for coastal and inland navigation projects. Other ports receiving funding under the plan include Jacksonville, Savannah, Corpus Christi, and Wilmington, North Carolina. The plan also includes funding for channel improvement feasibility studies for Miami, Tacoma, and Corpus Christi.